It's Tuesday evening and you haven't had a chance to dig out from the snow? 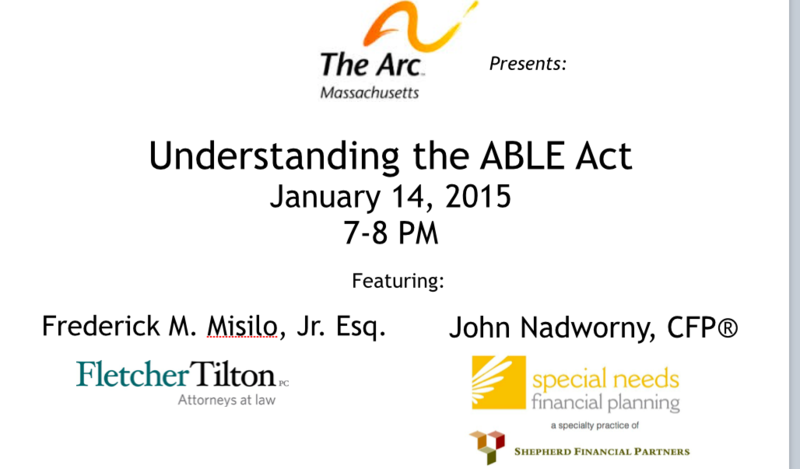 Dial in to a webinar sponsored by the Arc of Massachusetts about the ABLE act. The Achieving a Better Life Experience (ABLE) Act was signed into law on December 19, 2014 after many years of advocacy and bipartisan work in both the House and Senate. 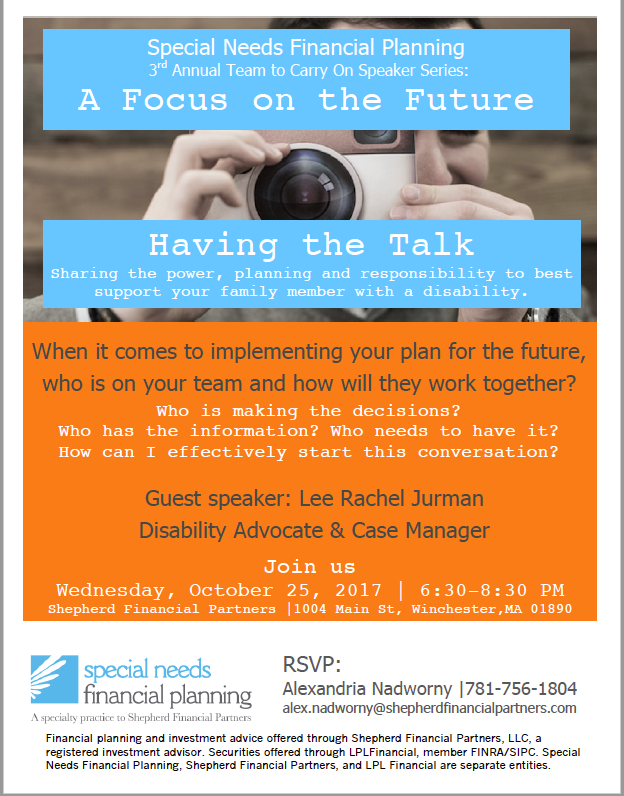 The law allows eligible individuals with disabilities the ability to establish "ABLE accounts" for qualified beneficiaries that resemble the qualified tuition programs, often called "529 accounts". 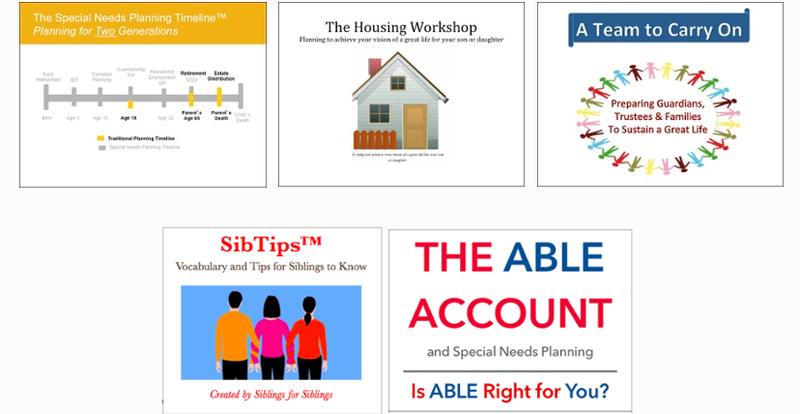 The new ABLE accounts will allow more individual choice and control over spending on qualified disability expenses and limited investment decisions, while protecting eligibility for Medicaid, Supplemental Security Income, and other important federal benefits for people with disabilities. 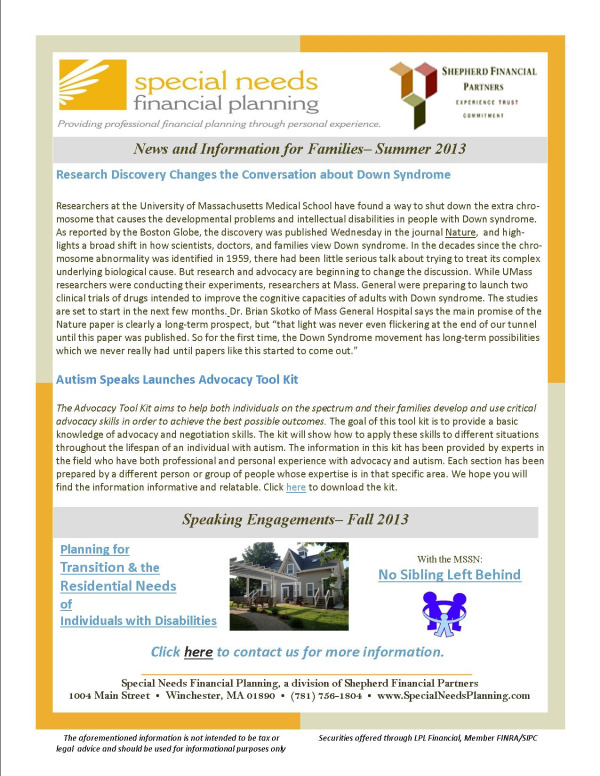 The Special Needs Planning Timeline- highlighting the planning pressure points when parents must be aware of changes in their child's benefits, legal and financial standing. A Team to Carry On- Planning beyond the wills and trusts to discuss guardians, trustees and how to carry forward your vision for your loved one when you are gone. 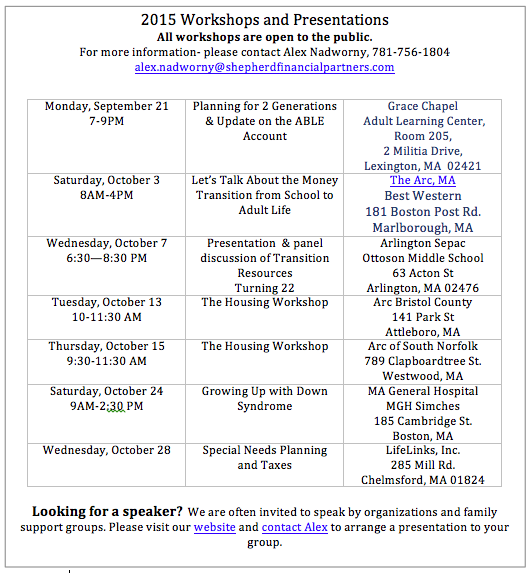 The Housing Workshop - A step by step planning guide for your child when they turn 22. 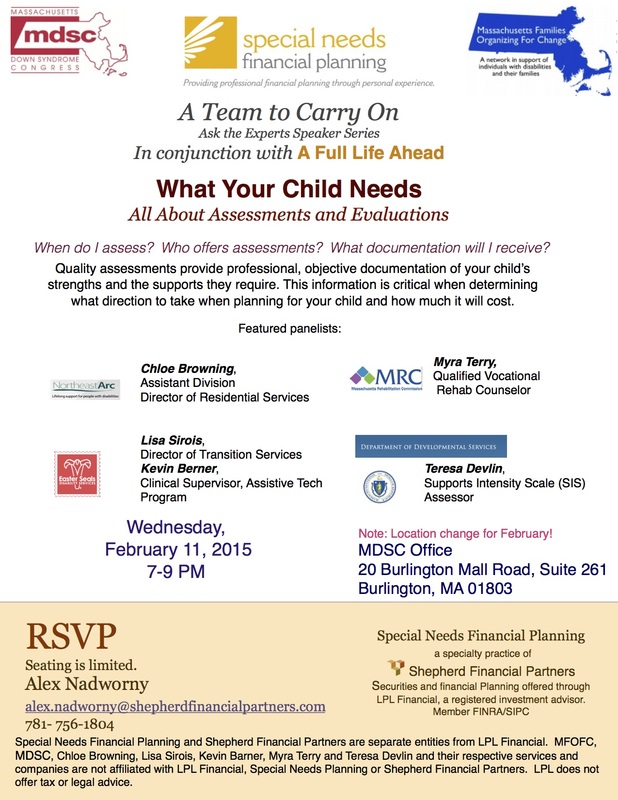 Learn: What is needed, How much it will cost and how to do it. Doctors, researchers and drug companies are coming up with simple designs to address a complex ethical dilemma: how to make sure people with intellectual disabilities consent to join a drug trial. With growing numbers of clinical trials getting under way involving conditions such as Down syndrome and Fragile X syndrome, researchers are trying new strategies to ensure people with the conditions, which typically involve intellectual disabilities, understand the risks and benefits of participating in trials. To read the full text of the article, click here. Ron Suskind tells the story of his family's life with Owen, beginning with his diagnosis of regressive autism at age 3 to today at age 20 and how Disney provided a means by which Owen could communicate. This article, featured in the Sunday New York Times Magazine on March 9, 2014, is adapted from “Life, Animated” by Ron Suskind, to be published April 1 by Kingswell, an imprint of Disney Book Group. Disney exerted no influence over the content of the book. The author acknowledges the rights granted to him for the use of Disney materials. His premise is this: "There’s a reason — a good-enough reason — that each autistic person has embraced a particular interest. Find that reason, and you will find them, hiding in there, and maybe get a glimpse of their underlying capacities. In our experience, we found that showing authentic interest will help them feel dignity and impel them to show you more, complete with maps and navigational tools that may help to guide their development, their growth. Revealed capability, in turn, may lead to a better understanding of what’s possible in the lives of many people who are challenged." Ron Suskind is a Pulitzer Prize-winning journalist and the author of four books about presidential power. He is currently the senior fellow at Harvard’s Edmond J. Safra Center for Ethics. 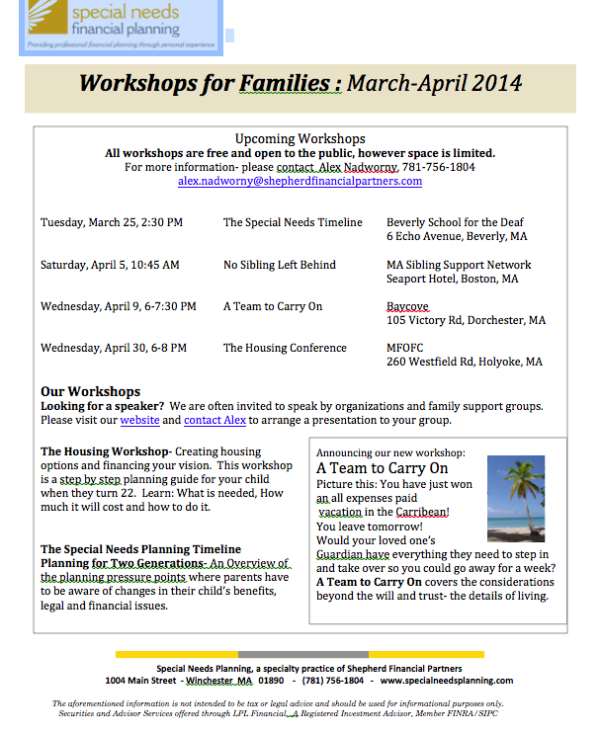 Click here to download a full size, printable version with enabled links. 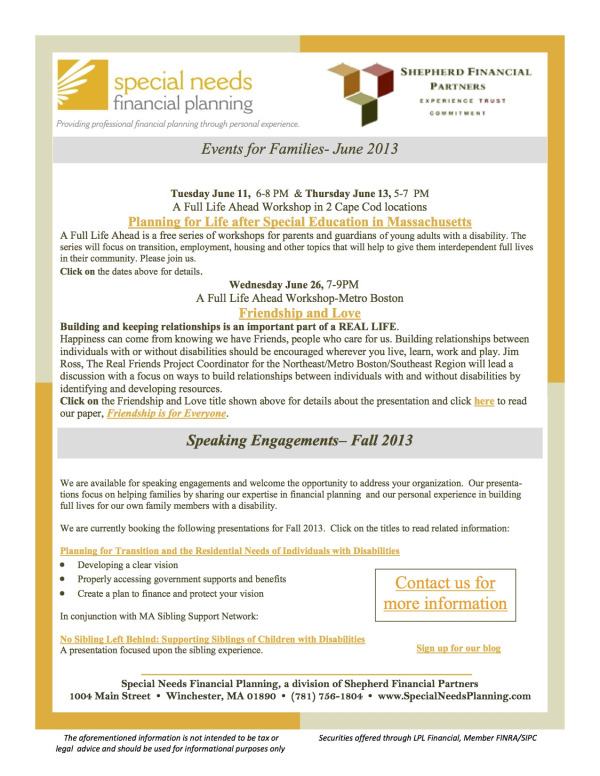 Click on the newsletter above to download the printable, full size version of Events for Families, June 2013.